Fabsyscrypto Ransomware is a new danger that can hit you hard if it manages to slither onto your system without your knowledge. This ransomware program can encrypt major files in most of your system directories, which may be a great loss if you do not have a recently made backup on a removable drive. Our tests indicate that this malware infection was based on the infamous Hidden Tear Ransomware open-source project just like its predecessors, APT Ransomware, Uyari Ransomware, and 8lock8 Ransomware. The problem with such an open-source project is that rookie schemers try to exploit them by making some minor modifications in the hope for easy and quick money. You may choose to pay the demanded ransom fee to get the decryption key but we must warn you that you would simply support cyber crime and there is no guarantee of your getting the key either. We are here to help you with a solution to remove Fabsyscrypto Ransomware from your system as soon as possible. This does not mean that your encrypted files will be recovered. However, it is possible that in the near future malware hunters will upload a free tool to the net that may be able to help you with that. Since these criminals may be first-timers, the most likely and effective way for them to spread this ransomware infection is using spamming campaigns. There are still lots of computer users out there who can be easily tricked. As a matter of fact, the new generation of spam mails could also fool a more experienced user since these use seemingly legitimate names and sender e-mail addresses that may appear to come from the authorities or any well-known and respected company. And that is just the first impression. The next line of silent attack on your mind and curiosity is caused by the subject such a spam refers to or claims to be about. This subject could relate to anyone in a way and this is why it is hard to resist temptation to open it. This spam can be about an alleged unsettled urgent invoice, a wrongly booked hotel room, issues with your credit card, and so on. Do you think you could say no to such a mail? Well, most likely no if you have infected your system with Fabsyscrypto Ransomware and now you are trying to figure out how you can delete it without causing more damage. In fact, the activation of this vicious threat takes place the moment when you run the file attachment you save from this spam mail. This file could look like an image, video, or text document. But in reality it is an executable file that you run and this causes the ransomware attack on your computer and the possible loss of your files, too. You need to understand that by the time you notice and then remove Fabsyscrypto Ransomware, your files will be all encrypted. This is why prevention is so important when it comes to such dangerous malware threats. But even if it is not possible right now to recover your files, we still recommend that you delete Fabsyscrypto Ransomware because there is no other way really to restore your system security. 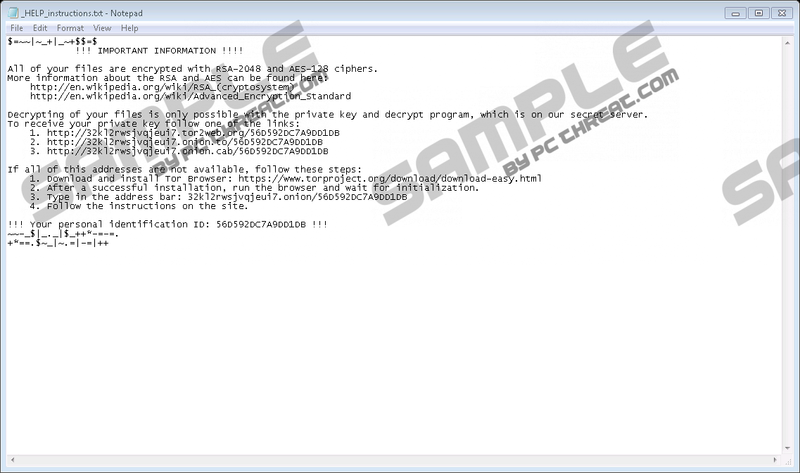 This serious ransomware program claims to use the RSA-2048 and AES-128 encryption built-in Windows algorithms and targets .txt, .doc, .docx, .xls, .xlsx, .ppt, .pptx, .odt, .jpg, .png, .csv, .sql, .mdb, .sln, .php, .asp, .aspx, .html, .xml, and .psd file extensions in major system directories, including AppData, Program Files (X86), Program Files, ProgramData, and Temp. All the ciphered files get a new ".locked" extension, which is quite common for a number of similar threats. This malware infection also drops its ransom note file called "_HELP_instructions.txt" in all the affected folders. This ransom note is identical to that of Locky Ransomware. You are informed in it about the attack and that your only chance to decrypt your files is to visit the provided websites through the Tor browser where you will find further information as to how to proceed to get the necessary decryption key. Although we cannot confirm the amount of the ransom fee yet demanded by these cyber criminals, we can tell you that it is usually between 0.1 and 1 Bitcoin, which is around 125 to 1,250 USD. But whatever this amount is, we do not advise you to contact such criminals in any way because it very rarely ends well. If you do not want to waste your money and lose more, we recommend that you remove Fabsyscrypto Ransomware immediately. In order for you to be able to eliminate this threat, we suggest that you open your Task Manager first and kill the malicious process. Then, you can take care of the related files. Please follow our guide below if you feel ready to handle this manually. Of course, you can also choose to use an automated method, such as anti-malware software (SpyHunter) to automatically detect and remove all potential malware threats from your computer as well as protect it from future attacks. We also suggest that you keep all your drivers and programs updated so that your PC becomes less vulnerable to cyber attacks. Identify the malicious process and click End task. Locate and delete the downloaded malicious file. It could be in default places, such as the Downloads, Temp, or Documents directories. Quick & tested solution for Fabsyscrypto Ransomware removal.